Historically, much of the world’s cacao has come from West Africa, but aging trees,crop diseases, pests, extreme weather and political instability make it difficult for the region to keep up with demand. 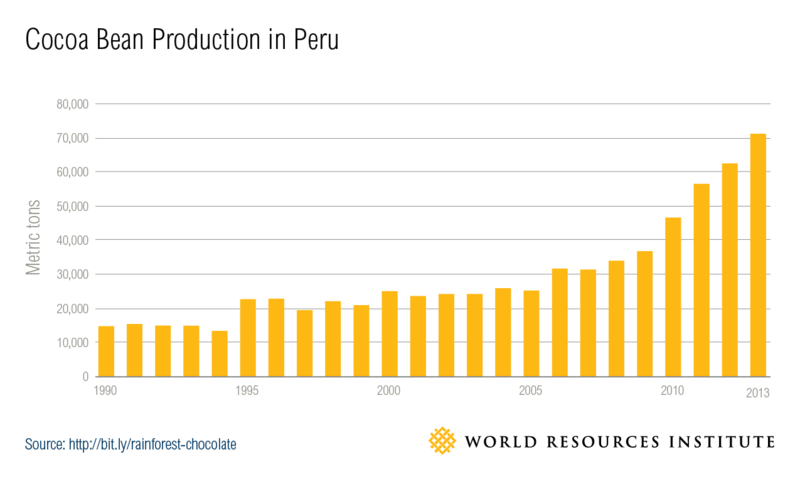 As production expands in South America, Peru in particular has seen a nearly five-fold increase in cacao production between 1990 and 2013. The most recent estimates from FAO and the International Cocoa Organization rank Peru as now being among the top ten cacao-producing countries in the world. As cacao production accelerates in Peru, the Amazon rainforest is becoming a target for cultivable land, and at least one new cacao-production company has already cleared thousands of hectares of carbon-rich, biodiverse forest. This is not novel: Countries like Côte d’Ivoire, Ghana and Nigeria have also experienced significant deforestation within their cacao-producing regions as plantations spread. This emerging threat to the Amazon comes at a time when growing public concerns about climate change have put consumer goods companies, that we all buy products from, under public pressure to increase transparency around and ultimately reduce the environmental and social impacts of their supply chains. To reduce their environmental impact, companies must first accurately measure it. However, limited data and methodological complexities used to calculate emissions from land-use change (in this case, conversion of non-agricultural land to agricultural land for cacao production) present a hurdle. Though lifecycle emissions analyses for chocolate production exist, most do not include emissions from land-use change resulting from the establishment of new cacao production areas. Or, if they are included, estimates are rough. Cadbury estimates that 169g (6 ounces) of carbon dioxide equivalent are emitted into the atmosphere for each 49g (1.7 ounce) Dairy Milk chocolate bar. This calculation includes emissions from the production of raw ingredients such as cocoa, cocoa butter, milk and sugar, and from packaging and distribution, but not from land-use change. Remote sensing technology helps to fill this data gap. In 2012, United Cacao began deforesting 2,000 hectares (nearly 5,000 acres) of carbon-rich Peruvian rainforest for a commercial cacao plantation. Despite its secluded location deep in the Amazon, NASA satellite images enabled researchers to collect data needed to estimate the resulting carbon emissions. Matt Finer of theAmazon Conservation Association used Landsat imagery to chronicle the clearing month-by-month and prove that the area was previously primary forest. Meanwhile, Greg Asner of Stanford University’s Carnegie Institution for Science used airborne LiDAR technology to estimate that the patch of forest contained an average of 122 metric tons of carbon per hectare (54.4 tons per acre). Research suggests that United Cacao’s plantation will store, on average, about 40 metric tons of carbon per hectare (about 18 tons per acre) over its production lifetime, meaning that over the deforested 2,000-hectare (approximately 5,000-acre) area, the net carbon emissions from land-use change will be 0.6 million metric tons (more than 660,000 tons) of carbon dioxide—about the same emissions as driving a car around Earth 60,000 times. What does that mean in terms of chocolate? Using United Cacao’s own cacao yield estimates, we calculate that the carbon footprint of chocolate is much larger when emissions from deforestation are taken into account. 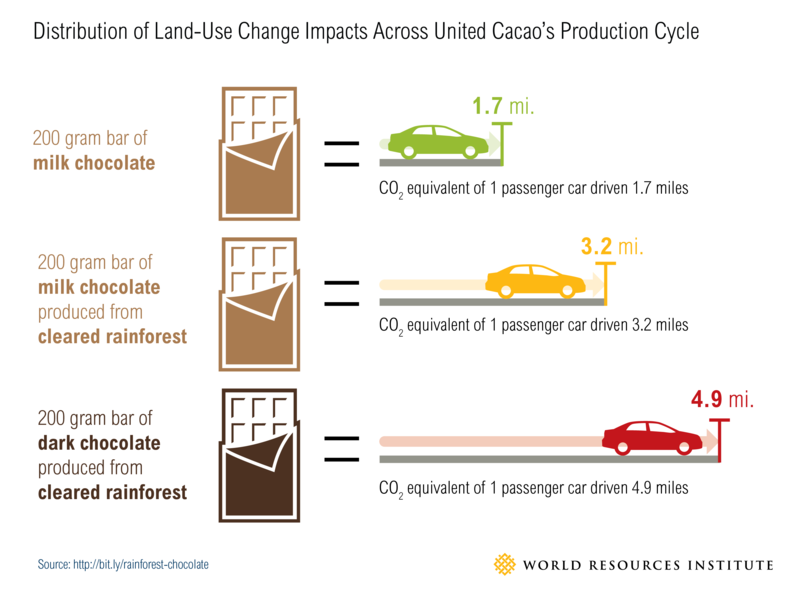 If emissions from the rest of chocolate’s lifecycle are, as Cadbury estimated, 3.45g of carbon dioxideper gram of chocolate (3.45oz per ounce), then sourcing beans from United Cacao would nearly double the carbon footprint of milk chocolate to 6.8g of carbon dioxide per gram (6.8oz per ounce) and triple that of dark chocolate to 10.1g of carbon dioxide per gram (10.1oz per ounce). It doesn’t have to be this way. Cacao expansion in South America presents a major opportunity for agriculture-driven restoration. Planting cacao on degraded lands could support climate change mitigation by avoiding emissions associated with deforestation. Sustainable intensification on existing cacao plantations could also avoid deforestation, forest degradation and their associated emissions caused by agricultural expansion. Finally, planting more shade trees can boost the carbon storage capacity of cacao plantations. Tambopata Candamo, a project of Tambopata REDD in Madre de Dios, Peru, provides a good example. Tambopata Candamo is a cooperative of cacao farmers that exchanges zero-deforestation commitments for financial backing and Fairtrade certification. This allows farmers to generate enough revenue from carbon offsets to repay investors and make a profit, in addition to profiting from cacao. As global cacao demand climbs and production shifts to new areas, producers should abide by sustainability standards like those set by the Sustainable Agriculture Network to help avoid unnecessary emissions from land-use change. Satellites can help quantify greenhouse gas emissions and thereby increase transparency around the impact of land and forest conversion for cacao production. This, in turn, allows for better monitoring of cacao expansion with tools like Global Forest Watch to catch risky activity and help measure the success of corporate commitments to protect forests. With such powerful tools, we can all keep an eye on what’s happening in the forests and help ensure the future for chocolate production is sweet. WRI has joined the 2015 Global Landscapes Forum as a Coordinating Partner. The Forum will be held in Paris on 5-6 December. To learn more about the event, click here. This article originally appeared on WRI’s blog. Este blog se puede leer en español.